This is a recipe we’re pretty excited about. It was born out of a wild idea and experimentation, and with a bit of luck, it turned out great! As always, feel free to fiddle… but after a few test batches (it’s a hard life, really), we’ve nailed down a recipe that delivers great results every time. You definitely need a good quality non-stick pan to make this work well (and to keep it fat-free). Also, we’ve used a couple of different types of bread and so far, there’s been only one that holds up well to this recipe. It is made by a company called Food for Life. They make many sprouted whole grain products. Their Sprouted Whole Wheat bread has a yellow label and though they have several varieties, the others we’ve tried don’t hold up as well. This bread has no oil, is totally McDougally and actually, has no flour. I emailed Dr. McDougall to see if it would work for the Maximum Weight Loss version of his program and he said that although the bread has no flour, per se, the whole grains are broken down rather than being consumed whole. So though it’s better than flour, if your main goal is maximum weight loss, you probably want to consume this bread in moderation. 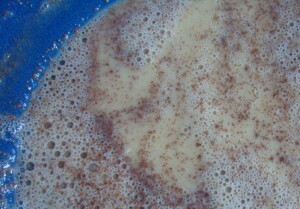 Mix all ingredients in a bowl and whisk together until everything is well combined and the egg replacer starts to get foamy. Pre-heat non-stick skillet as you would for pancakes. Dip slices of bread into mixture and soak well. Place on hot skillet and cook about 2 minutes on one side. 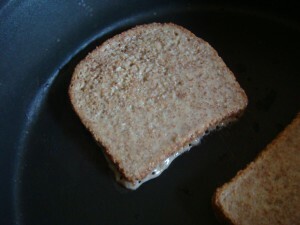 Then, use a spatula to carefully loosen bread from the pan, and flip it over. It will be very sticky and the wet bread can fall apart. Be sure to scrape it cleanly from pan when flipping so it remains crispy on the outside. Cook until both sides are brown and the center is no longer runny. Serve with powdered sugar, if desired, and real maple syrup. You also might want to try our previously posted Banana Maple Compote as a topping. 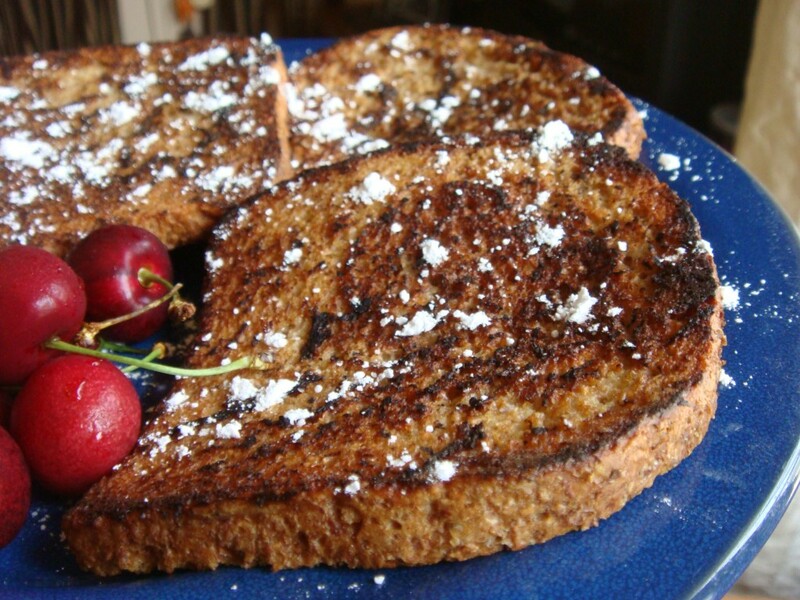 Recipe is enough for about 6 slices of French Toast. This recipe looks AMAZING! And I am so excited to try it. I recently read Eat to Live by Joel Fuhrman (whose ideas are similar to McDougal) and he generally frowns upon bread. Which was tragic for me because french toast was my favorite meal before I became a vegan. Thank you for posting this! I lovee your blog! Thank you so much, Bryanne!